With its historical past, there are many Buddhist pilgrim centres in Bihar state like Patna, Bodhgaya, Rajgir, Vaishali and Nalanda etc. Rajgir, the ancient capital of the Magadhan empire is a popular tourist resort besides being a major Buddhist and Jain pilgrimage centre. It is in Nalanda district. Rajgir meaning 'the Royal Palace', (Raja Griha) lies 12 kms south of Patna. Rajgir was the first capital of the kingdom of Magadha, a state that would eventually evolve into the Mauryan Empire. Eventhough, its date of origin is unknown, some ceramics dating to about 1000 BC have been found in the city. Rajgir is a site of great sanctity and significance for Buddhists. Many interesting ruins, caves and stupas in the area testify to Rajgir's ancient eminence. The Gridhakuta Hill, in Rajgir, was the seat from where Bhuddha delivered many of his sermons. An aerial ropeway takes visitors up the hill where the Japanese have built a massive modern stupa, the Shanti Stupa (Peace Pagoda), at the top of the hill in commemoration. It is fun ride to take the Aerial Chair lift which operates every day except Thursday. One way ride takes 7.5 minutes and the view is splendid over the hills of Rajgir. Aerial Ropeway ticket cost is 60/- RS per Head. 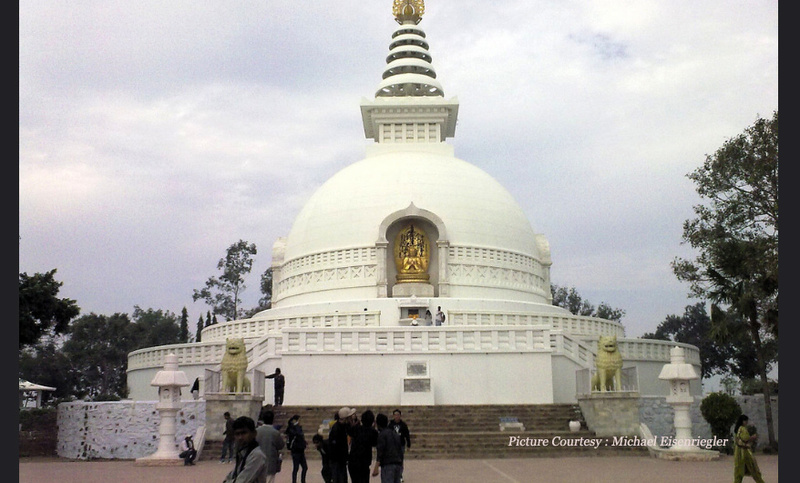 Many sites of historical and achaeological significance surround the holy city of Rajgir. Bimbisara Jail reminds one of the devoted Mayuryan King Bimbisara (5th -6th century BC) who being a buddhist, chose this as a place to spend his last days. From here he could see Buddha climbing up the Grihakuta Hill to do his meditation. There is a clear view of the Japanese Pagoda. The stupa of peace was built on the top of the hill. Ajathashatru's fort is another place of tourist attraction. Built by Ajatshatru the king of Magadha during the Buddha's time. The Ajatshatru's Stupa is also believed to have been built by him. The sculpture which depicts the 'Parinirvana', or the great cessation of Buddha is another historical importance. It shows the Buddha lying on his right side with the right forearm resting under his head to commermorate the final salvation or Mukti of the great founder of the Buddhist Faith. Other prominent sites of importance at Rajgir include Saptdhara (seven streams), the hot springs which supposedly have healing powers. It is situated at the foot of Vaibhava Hill, a staircase leads up to the various temples. Seperate bathing facilities for men and women have been organized. he water springs are supposed to have their source at Saptaparni Caves. Venuvan Vihara, the residence built by the king Bimbisara for Buddha to reside. This was the king's first offering to Lord Buddha; Jivakas Mango grove residence of an ardent Buddhist follower, Jivak who was the Buddha's physician and the Karanda Tank, the tank in which Buddha used to bathe. Saptparni Cave or Sattaparnaguha Cave, located on a hill where the first Buddhist council was held immediately after the Mahaparinirvana of Buddha. On hill crests around Rajgir, one can see about 26 Jain Temples. They are difficult to approach but for trekkers it is a worth visit. Besides, Rajgir is famous for stone Sculptors and bowls. The town also hosts Rajgir Dance Festival and Malamasa Mela. Surrounded by forested hills, Department of Tourism, Bihar holds a colourful festival of dance and music, Rajgir Mahotsav or Dance Festival every year in Rajgir. Be it instrumental music, devotional songs, opera, folk dance, ballet or the many schools of classical dance and music, geniuses in their own realms of accomplishments, create an almost ethereal atmosphere. Some of the eminent artists who have performed here include Sonal Man Singh, Hema Malini, Swapna Sundari, Madhavi Mudgal, Anand Sankar etc. This festival held during last week of October attracts tourists in large numbers.